The first home-grown gooseberries are small, hard and very sharp - perfect for a fool, that simple and very English combination of whipped cream and stewed fruit. If you can manage to lay your hands on a few heads of elderflowers, use these instead of cordial to perfume the cooking juices; cook the fruit in plain water, drop in the whole elderflower heads, stalks and all, and remove them before you sweeten the fruit. 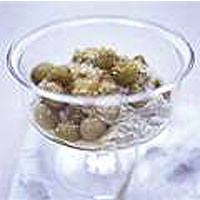 Rinse the gooseberries and put them in a pan with the elderflowers or cordial (if using), water and sugar. Simmer gently, loosely lidded, until really soft - about 10 minutes. Squash thoroughly or give them a quick whizz in the food processor, but don't sieve - the crunchy little seeds are half the joy. Taste and stir in more sugar if the purée is a little tart. Allow to cool and combine with half the crème fraîche. Spoon into pretty glasses, top each portion with another spoonful of crème fraîche and sprinkle just before serving with a crunchy topping of demerara sugar. Add a sprig of lemon balm or a fine curl of lemon zest if you like, or garnish with more gooseberries, lightly fried in butter.